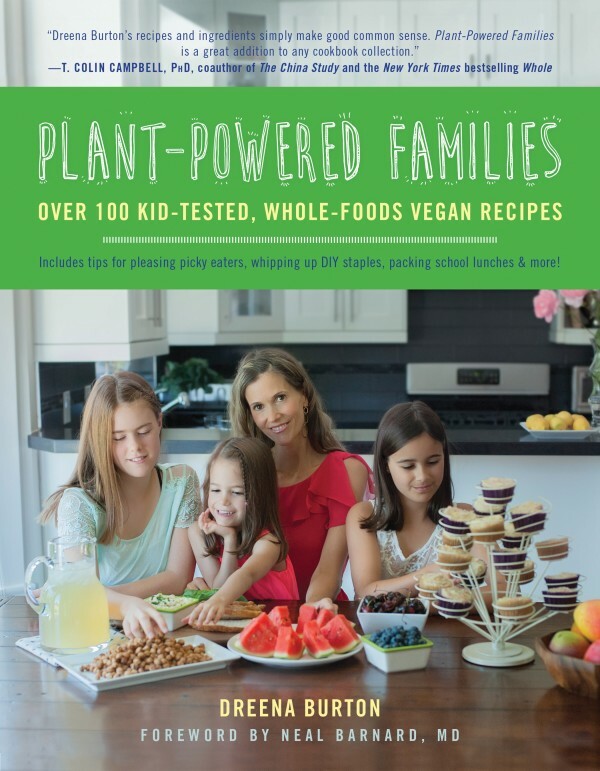 Plant-Powered Families: Book Review, Recipe and GIVEAWAY! I have some really cool friends. One of them is the incredible vegan cookbook author Dreena Burton. Dreena was so kind to give me a copy of her brand new cookbook Plant-Powered Families AND to offer you, my dear readers, the chance to win one too! Why You Too Should Love Dreena! Before I met Dreena through Twitter, I was a big fan of her recipes. They always used whole food ingredients, were easy to make, and used ingredients that I already had. 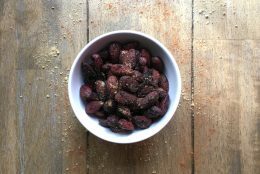 Now, I’ve been plant-based for 10 years now so things like nutritional yeast, various nuts and seeds, and plant proteins are staples in my kitchen. If you’re new to vegan cooking, there may be some things (like our beloved nooch!) that you need to go out and buy. I’ve been known to make her recipes, especially dessert recipes, and bring them to potlucks and get loads of compliments. I feel good that I’m ever so secretly introducing plant-based, healthy foods to my friends so that any judgments or preconceived notions of what vegan foods tastes like don’t get a chance to interfere with their tastebuds. I also feel good because I’m sharing foods that are good for the body. I’m not loading down my and others’ bodies with tons of sugar, refined flours and nutrient-poor goodies. I’m giving them food that is full of nutrients and that even feels nourishing as you eat it. What’s awesome about Dreena’s latest Plant-Powered Families is that it is not only a source of over 100 recipes. It’s also a resource to help with common challenges like feeding picky eaters, what to pack for school lunches, and hosting and attending kids’ parties. These are real issues that, if you’re a vegan parent, you definitely have or will encounter! There is Plant-Powered Support for those who want more guidance. Wondering how vegans get protein, iron and calcium? There are nutrient charts that show the amount of various nutrients per serving and per calorie. There is even a two-week meal plan that (get this!) includes the nutritional breakdown of the meals including calories, carbs, protein, fat, omega 3’s, calcium, iron and more! The percentage of calories provided by the carbs, protein and fat is also provided. As a dietitian, this is just what I would want in a cookbook! There is something here for everyone! And Dreena is letting me share one special something with you! You can make this creamy, delicious (and very authentic-tasting) Caesar dressing as is, or add nutritional yeast for a cheesy twist. Using a blender, combine the cashews, 1 tablespoon of the nutritional yeast, chia, sea salt, kelp granules, capers, garlic, black pepper, milk, lemon juice, and maple syrup and puree until very smooth. Add more nutritional yeast for a cheesier flavor if you like, and add extra salt/black pepper/garlic if desired. Serve tossed into romaine lettuce. Kelp Granules Note: If you have trouble finding kelp granules, they can be omitted. The dressing is still delicious without them! Milk Note: I prefer plain unsweetened almond milk or soy milk in this recipe, but you can choose another if you prefer. Idea: Adults might enjoy a little extra hit of capers, garlic, and black pepper in this dressing! Kitchen Tip: This dressing will thicken after refrigeration. You can thin it by stirring in 2–3 teaspoons of milk or water if desired. Serving Suggestions: In addition to serving traditionally as a salad with romaine, you can keep this dressing thick (reducing milk) and use as a dip or sandwich spread. Sounds good, eh? You betcha! Now enter to win your own copy of Plant-Powered Families! Plant-Powered Families by veteran cookbook author Dreena Burton shows a whole foods, plant-based diet can be easy, delicious, and healthy for your entire family. In Plant-Powered Families, Burton shares over 100 whole-food, vegan recipes–tested and approved by her own three children. With tips for handling challenges that come with every age and stage — from toddler to teen years — Plant-Powered Families is a perfect reference for parents raising “wigeons” or families looking to transition to a vegan diet. Dreena Burton has been vegan for almost 20 years, in that time writing four bestselling cookbooks charting her journey as a plant-powered cook and at-home mother of three. 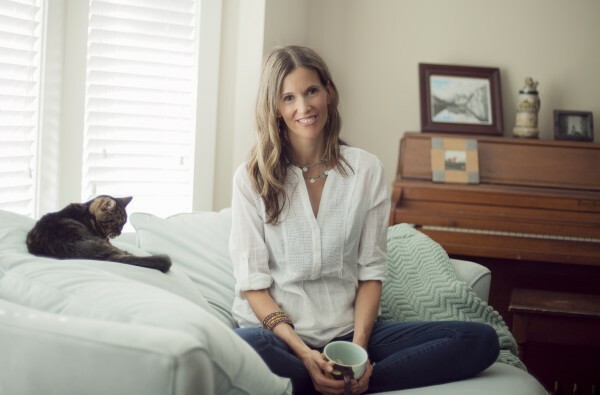 Always passionate about creating nutritious recipes, she is an advocate of using the “vegan basics” to create healthy, delicious food for the whole family. Affectionately dubbed “Queen Bean” and “Vegan Cookie Queen” by her readers, Dreena is one of the pioneering vegan cookbook authors. Her cookbooks have garnered a loyal following, and Dreena has earned the respect and repute for reliable, wholesome recipes. 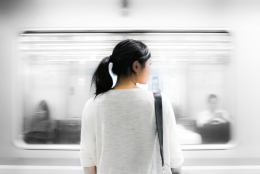 Connect with Dreena on her website, Facebook, Twitter, Instagram and Pinterest. I’m helping to raise two of my grandsons and though they love the homemade healthier treats, we’re still working on the veggies. I’m constantly trying new recipes that I’d think they’d like, but not always successful. Still working on more plant-based meals. We don’t have kids yet, but when we do, they’ll be plant-powered. It’s so great to see resources like this, paving the way. I would love to gift this book to my sister-in-law so that she can better support her children’t nutrition in a plant-based way! 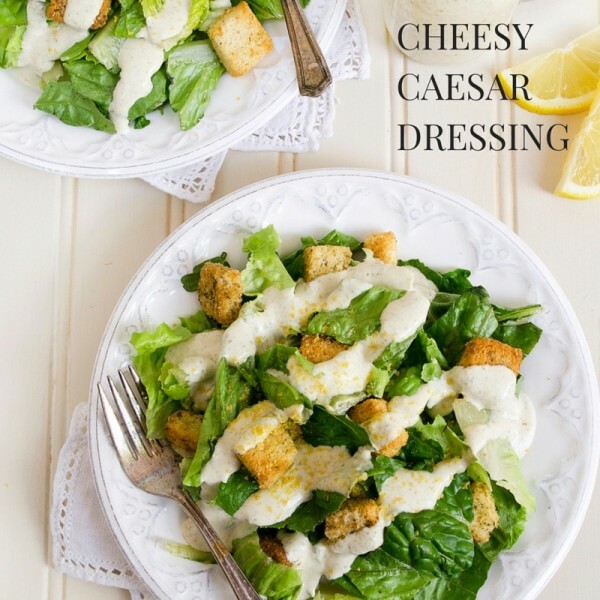 Caesar dressing is one recipe I’ve never tried. I’d love to try this recipe and others from her new book. I think I’ll try the dressing this week! 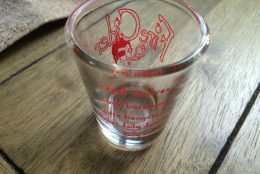 I don’t have any kids, but it would be a great gift to give my brother for my nephews! We are working on it we are fully vegan and working to whole foods its been a slow process starting with a 9 and 6 year old used to a standard American diet they are 10 and 7 now and nearly there. My advice be patient and start with foods they love gradually making it healthier. not in the traditional sense of children but i do feed my dogs lots of veggie and fruits! I don’t have children, but I do try to encourage my hubby to eat more plant based foods for health reasons. I try to make delicious recipes as my health allows. I focus on plant based versions of foods he enjoys. I want this book! Period. I would love to win a copy of this cookbook. It sounds great. I am a newly plant based Grandma so I need tasty food my grandchildren will love and request over and over. Thanks! I don’t have any offspring, but I do have one big man-child. The key to getting ANYONE to eat ANYTHING is that it must taste delicious. Work with flavors you know they love and go from there. Thanks for hosting this giveaway! As a mom of five growing boys, I’m always looking for more ideas to expand my recipe files. Eating for health can be delicious! My partner & I love Dreena’s recipes. They’re not only kid-friendly–they’re omni-friendly as well. Thanks for the giveaway! I would LOVE to win this cookbook. We recently switched to a plant-based diet and I am pleasantly surprised at how much my two teen-aged boys love it! We would love more recipes to try out! We are about to go vegan and my kids are so picky. This is JUST what I need!